Let me give you the background. 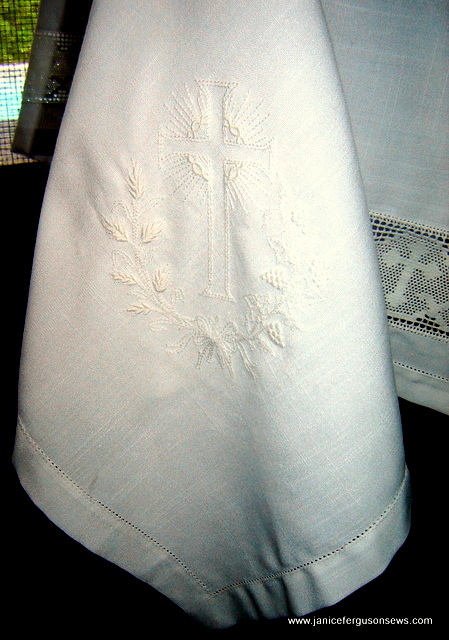 A few years ago, I helped my Aunt Rheeta make a spectacular set for her church, using fine linen, this same liturgical lace, and the same design set. The pictures are not good at all, but you can see hers by clicking here. Of course, I hoped to create an equally beautiful communion set, worthy of it’s sacred purpose, for my church. The worship committee, who decides such things, requested that the fabric be “easy care.” Hmmmmm…I offered to launder the set after every use, but they were insistent that it be easy care. First, I called Sally at Farmhouse Fabrics to see if she had a good quality 60″ linen blend. But she didn’t. After checking around, I reluctantly purchased a few inches of several sample fabrics from our local JoAnn’s. On each of these, I rehearsed the pin stitch and entredeux stitches. My best results were on a 51″ wide piece of linen look poly. I thought that would work. Because the cloth required 60″ of width, a piece was sewn on either side of the center panel. Entredeux was worked along the seam line, but looks very rough because it was stitched over two thicknesses. On real linen, that has always worked beautifully. But ultimately, puckers appeared. Even though everything was flat while the hemstitching (both entredeux and pinstitch) was being worked with Stitch & Ditch stabilizer beneath the heavily starched, flat as a board fabric, after a very short time, it puckered. Do you have any suggestions for eliminating the pucker? I’m thinking about using a liquid starch and pressing it stiff. But it seems that Florida’s humidity will ultimately overcome the starch. Another problem is that the back of the lovely embroidery has scratchy dots of melted-but-not-disappeared plastic, even after many hours of picking it off with tweezers. I learned that it is not a good idea to use iron-away stabilizer on a blend. If the iron is hot enough to melt the stabilizer, it will scorch the fabric. So the back of each embroidery is rough, at least until I have a few extra hours to pick it off. Do you have any suggestions for removing these bits? 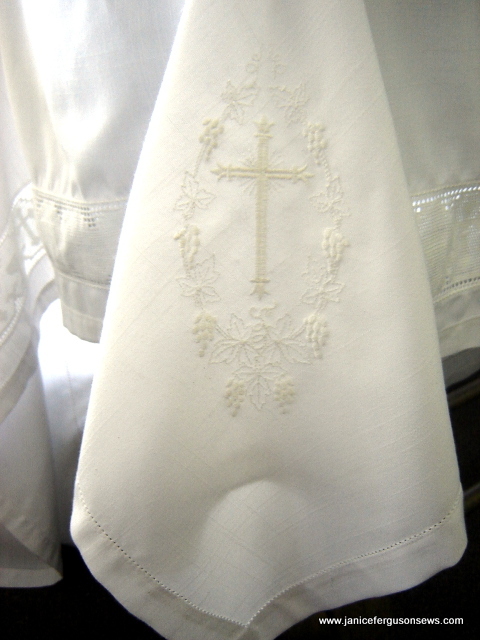 All of the embroidery designs came from the Christian Symbols collection from ABC Embroidery Designs is absolutely gorgeous. And it is on sale now for $15, regularly $47! The thread I’ve used is a favorite of mine, Robison-Anton’s 100% cotton 50 wt. thread. I first used it to monogram linen napkins and fell in love with the texture it gives. When it came time to make the veil to cover the bread, I just went with quality 100% linen. I am satisfied with the 22″ hemstitched square with mitred corners to match the cloth. It lies perfectly flat and the washaway stabilizer left not a trace. 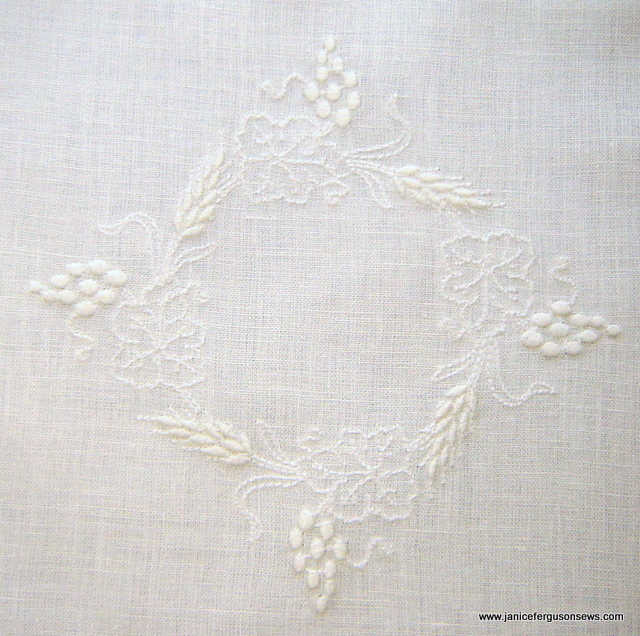 It is embroidered in the center with a design of grapes and wheat. I’m wrestling with whether or not to present this to the committee. Later this summer I could start another with good linen if they allow it. But sadly, I’ve used up all the liturgical lace on this project. If I had more, I would just start over. But this was a once in a lifetime purchase from Farmhouse Fabrics. Any suggestions would be appreciated. 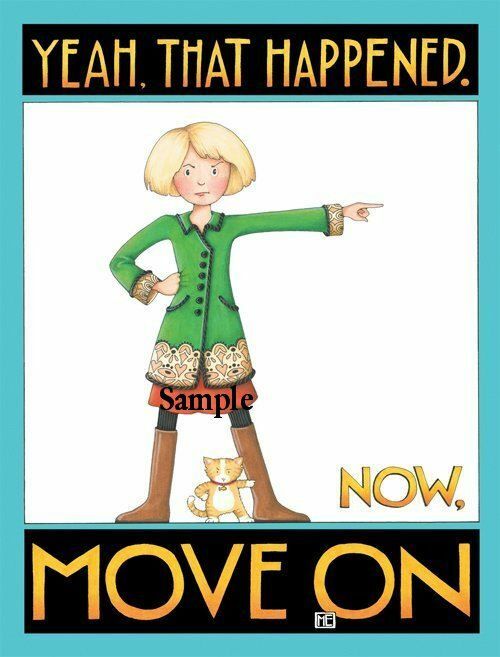 I should probably just follow the advice of the sage contemporary philosopher, Mary Engelbreit. 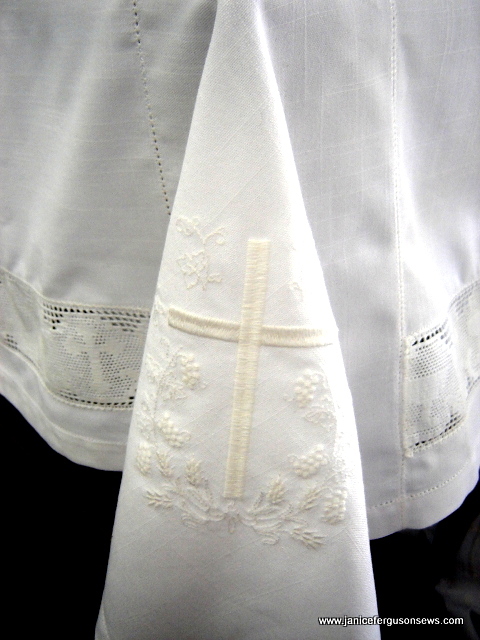 This entry was posted in church projects, heirloom sewing, machine embroidery and tagged communion cloth, hemstitching, liturgical lace, liturgical linen, machine embroidery, religious embroidery. Bookmark the permalink. I think it’s lovely and I really don’t see the puckering!! I think you are your own harshest critic and the committee at church will love it. I can understand why they wanted something easy to care for. You are so generous to share your talents with so many people! I don’t know about getting off the stabilizer. I’ve never used that kind. Could you blast it with a heat wand quick enough to melt it without hurting the fabric?? I think it looks beautiful! I don’t think the puckering is enough to worry about. The majority will probably not even notice it. Can’t help you with the stabilizer. It is the fabric –and its fine. Yes, you notice it but the untrained eye will notice the absolutely beautiful lace and embroidery. This is truly something to be proud of! Janice, honestly, I think it is beautiful. You are too hard on yourself. As for the iron away stabilizer, I used it ONCE. It wouldn’t dissolve for me either. My project was on a 100% cotton blouse and I ironed and ironed and ironed. Finally I got so angry that I could have taken a blow torch to the darned thing, but stopped myself. LOL. The blouse was for myself, so I told myself that it would be my little secret. I have never used that stuff again though. Janice, I have to agree with the others, it’s beautiful. Starch and iron it and don’t think about it again. Next time, just refuse to work on blends and insist on natural fibers. Put your foot down! That lace is just gorgeous. I remember visiting my great aunt’s when I was little. She was always ironing altar cloths, as we called them. Sadly I think we are often our own worst critic! However, I think your cloth looks fine…..not what you wanted it to look like perhaps…but as someone else said, the untrained eye will probably not notice. Interestingly, I too, am currently working on a similar church project right now. 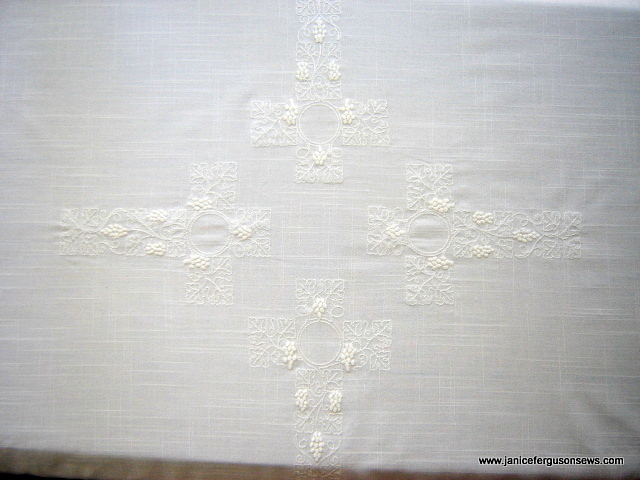 I am making my cloths using Oslo Hardanger (100% cotton) fabric and doing Hardanger embroidery on them. I have 3 cloths to make and have one finished. I will email you privately with some of my experience with this. Thanks for sharing yours! The embroidery is beautiful. I see where the puckering is occurring with the entredeux. I think starching it well will do the trick. Assuming that the church is air conditioned, I think a heavy spray starch will be fine. As someone else mentioned, unless they are experience seamstresses, I don’t think anyone will take notice. I doubt many woman in the church iron as much as we who sew beautiful heirloom pieces. Try not to stress, but I do think your offer to launder it in the future should be taken, simply to take better care of it and have it last longer! I think it is beautiful! The congeration is not going to be sitting on top of it, so it is going to look like fine linen to them. Present it to the committee as if it were pure Irish linen….they will be in awe of your work! Again the problem is mixing cotton lace and a poly fabric. If you don’t do the care required of this lovely piece, I’m afraid the worship committee will come to realize their mistake. You may also see puckering of the cotton embroidery. Always iron embroidery on the back over a terry towel. Your work is exquisite! I wish I had the ability to embroider as you. It is a God given talent. 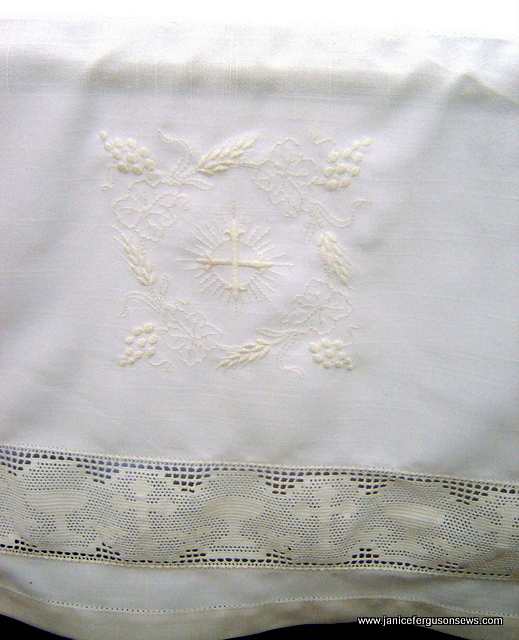 Explain to your worship committee the meaning of fair linen to be used in communion service and not polycotton. Thanks to you all for the encouragement and understanding. The committee said to just put it, sight unseen, on the altar for communion this morning. It has been heavily starched and pressed and looks as good as it’s going to. I’ll take pictures of the way it hangs and see what you think then…..Thanks again for all your sweet comments.